July 30. At the present moment I’m contentedly watching Chris, Randy and Melanie as they climb the Tetons in a ski lift. My cowardly fear of heights relegates me to sitting on the ski lodge patio at the base of the mountain. I can only imagine the beauty of the expansive views at the top of the mountain; I will content myself, with the photographs they bring back and vicariously enjoy the natural beauty that will envelop their souls. Actually sitting here and seeing the ski lifts ascend, it all seems so simple. I almost had the courage to cast off my cloak of fear and abandon myself to this wild pleasure. Perhaps one day, it will happen. In the afternoon, we stopped at the Driggs City Center to see the annual Driggs Digs Plein Air art exhibit. (Driggs is the adjacent town to Victor where Randy and Chris live). This weeklong event attracts artists from the region and beyond. On our way to the ski lifts we stopped momentarily to view the scenery below and there we observed one of these artists from Victor, Colorado, painting the Tetons. At the City Center exhibit there were several interpretations of the Tetons by different artists. 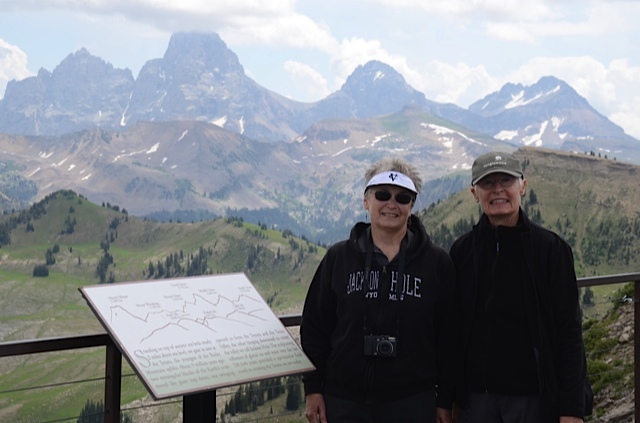 We arrived at the Isaacsons late yesterday afternoon after driving across Wyoming in periodic rain showers over miles of flatlands and then the rolling hills of the Tetons. This terrain, empty of human existence, save for the occasional car or truck on the highway, holds the viewer in awe. The flat dusty topography against the backdrop of the verdant hills and mountains is mesmerizing. As the plains slowly gave way to rolling hills, we were enveloped on one side by tall trees that reminded us of the deep green foliage of Humboldt County redwoods and the other side reminiscent of the high desert. Needless to say, this is astoundingly beautiful country. 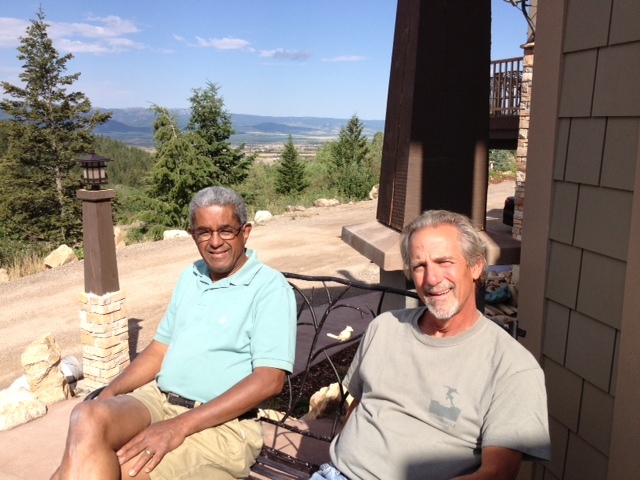 Randy and Chris’ home sits at the slope of the Tetons. This mountain hideaway is remarkably beautiful and deserves to be featured in Architectural Digest. Planned by Randy and Jack Plennert, an architect and mutual friend from South Bend, the house has breathtaking views of Big Hole Mountain. This morning I particularly enjoyed standing on the upper deck and looking down at the valley below bathed in a sunlight that in the distance cascaded over the variegated green hues of the mountain. For an instant I believed I was in the Swiss Alps overlooking a little Swiss village. The home’s exterior is framed by rock gardens of native plants and flowers, giving the effect of a living canvas of sustainability that accentuates the home’s natural beauty. The interior is exquisitely appointed in the craftsman style with a mix of antiques and modern pieces that complement each other. The use of wood and stone throughout provide intimacy and warmth. In the foyer and at the base of the stairwell, there is a bench of Indiana limestone with the IU pitchfork and the years of Randy’s teaching, 1975-2010, etched in the stone. It was Jack who gathered these remnants from the refurbished Associates Building to honor Randy to whom a new building for the School of Education was promised in his early years of teaching. This afternoon is quiet time. Randy is outside tending to his flowerbed; Chris is preparing dinner; Melanie is checking e-mail; and I am writing this blog. Tomorrow we will visit Yellowstone. Melanie and I have never been there, so it will be a special treat. Monday morning we left the historic French town of St. Charles where we spent the night after a long drive through numerous thunderstorms from Asheville. If I had planned correctly, we would have stayed with friends. I had visited this charming little town on the Mississippi in the early nineties when I lived in St. Louis. I regret that I did not then explore more intimately this quaint area. Since there was insufficient time to explore, I’ll have to place it in my Happiness File for a return visit. Heading westward, I recalled a much earlier journey, the Lewis and Clark Expedition. We, like them, were embarking on new and exciting discoveries. Because we knew that we would be arriving about noon in Kansas City, renowned for its barbecue – and jazz — we asked the hotel clerk for a recommendation. After a Google search, he suggested Arthur Bryant’s Barbecue And what a treat it was! Melanie’s pulled pork and my barbeque beef tips left us with mouths dripping with savory juices. Jammed packed, the clientele of this African-American establishment was predominantly white, locals and tourists alike. On the wall were pictures of politicians and celebrities who dined there including Jimmy and Rosalyn Carter, Stephen Spielberg, Harrison Ford, John McCain and Sarah Palin, among many others. On the wall were pasted journalistic reviews from Bon Appétit, People, Southern Living and Esquire. After lunch, we continued our westward trek. As we first crossed the rolling green hills of eastern Kansas, the panorama of countless herds of black cattle recalled images of the old west of cattle hands and cowboys. Imprints of the old west frontier were further burrowed in my mind as the green vistas slowly evaporated into broad empty flat spaces of withered, dry sandy-colored brush of western Kansas and eastern Colorado. I imagined our Toyota Hybrid as the covered wagon traversing the limitless horizon of open spaces. We stayed overnight at Hays, Kansas, where Fort Hays State University is located. Since there was still lingering daylight after dinner, we decided to visit the campus. We passed through a fairly non-descript downtown of small buildings with movie-set storefronts. The university sits across a railroad track at the end of the town’s major thoroughfare. The campus was like a ghost town. Hardly a sign of life was seen except a lone young woman jogging. The next morning as we continued our journey, feelings of awe and wonder of the expansive plains landscapes invaded my spirit. And as we rolled along at the lawful speed of seventy-five miles per hour, Melanie, who had lived in Colorado, spoke glowingly about the beauty of the plains. And with eager anticipation we expected at any moment the Rockies to rise in the distant horizon. Anxious for me to see the grandeur of the Rockies, Melanie kept prodding me to be vigilant for the first appearance of the Rockies in the horizon. 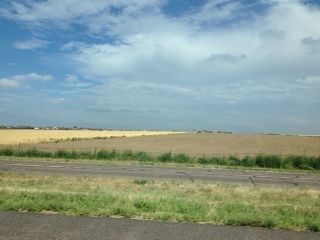 As we approached Denver, I strained to see but a faint outline of mountains as the day was hot and hazy. Since we arrived a day earlier for the Society for Values in Higher Education conference, we stayed overnight in Aurora, a suburb of Denver, where we also had Melanie’s car serviced for its 5000 mile check-up. We had dinner at a retro diner, Rosie’s, that played music from the 50s and 60s. If chance finds you in Aurora, we recommend a visit there. The SVHE conference is arranged by interest groups that convene from year to year, such as “Celebrating the Search” where discussions center on personal spiritual journeys. Melanie and I typically participate in the session on the historical novel. The four books chosen for this year were The Rise of David Levinsky by Abraham Cahan, Daniel Deronda by George Eliot, Wolf Hall by Hilary Mantel, Pure by Andrew Miller. Melanie and I led the discussion on Pure, a novel about the removal of the Holy Innocents Cemetery shortly before the French Revolution. On Thursday evening, Melanie and I skipped the residence hall food at the university for a delicious meal at a charming French restaurant, Le Central. The ambience placed us in our beloved Provence as we dined on bouillabaisse and a special lobster dish to celebrate the centennial of the Tour de France. The meal was all the more memorable with a bottle of Provence rose’. We took a break from the conference to be with our friends from IUSB, April Lidinsky and Ken Smith, who with their daughters, are visiting April’s parents. We met April, Ken, April’s parents and other family members at the Colorado Boat Festival where we had a splendid time watching the dragon boat races on Sloan’s Lake and seeing several Asian folk dances. The day was unbearably warm in this mile high city, but the food and other activities all added up to a remarkable fun event. April took this “selfie” photo of all of us. Tonight we are in Laramie, home of the University of Wyoming, before heading to Victor, Idaho to spend a few days with Randy and Chris Isaacson. The air is thin here and the weather is cool, in the 60s, similar to what we had in Denver and a far cry from the suffocating heat of the Carolinas. There is an expression in Dutch to live like God in France, meaning to live well. Now in my third week of retirement and having visited family and friends in Tennessee and North Carolina, I can unequivocally say that I am living like God in France. 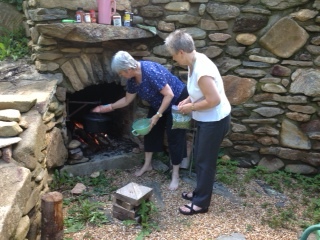 Our sojourn with the Shillingsburgs in the mountains and now our visit with Gordon and Linda Wilson in Asheville, is allowing both Melanie and me to unwind. Gordon, recently retired as professor emeritus of philosophy from the University of North Carolina Asheville, and I were former colleagues at Xavier University of Louisiana in New Orleans. It was he who arranged an invitation for me to lecture on the literature of the free people of color in Louisiana last year at the Royal Academy of Arts and Letters in Brussels where he was doing research on Henry of Ghent. As one of the world’s preeminent scholars of Henry of Ghent, he has edited seven volumes of Henry of Ghent’s writing. The Wilsons live in the backyard of the Blue Ridge Parkway. Each morning I took a strenuous walk in their neighborhood ascending and descending the rolling hills in a canopy of tulip poplars, maples, sourwoods, oaks and crepe myrtles. Since our arrival, we have been wined and dined sumptuously. Each evening began with a cocktail at five, an old-fashioned, a cosmopolitan, or a Limoncello martini. These were accompanied by hors d’oeuvres or amuses-gueules. A delicious cordon bleu meal followed. Both Gordon and Linda, New Orleans natives, who have lived and traveled extensively in Europe, appreciate the tantalizing and exquisite taste of food that is well-prepared and beautifully presented. Our first night of pan-seared trout, toppled with crabmeat in a buttery sauce delighted the palate. Thursday’s dinner of veal over quinoa spaghetti with an herb, caper and balsamic vinaigrette sauce rivaled the finest cuisine of New Orleans’ restaurant. After dinner liqueurs enlivened the spirit as conversation lingered over current events and past memories. Yes, we are living well in Asheville. On Friday, the Wilsons introduced us to Greenville, South Carolina, a jewel of a town. Its main street is reminiscent of Aix-en-Provence with its canopied trees and open-air cafés. 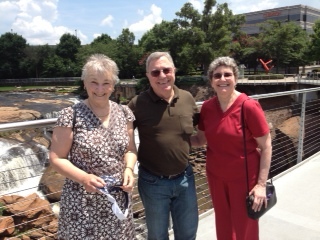 We lunched at Passerelle, a French restaurant in a park near the Reedy River at the base of Main Street. Later in the evening, upon our return to Asheville, we continued our culinary journeys with an extraordinarily delicious meal at Rezaz, a Mediterranean-themed restaurant. This is a must stop for visitors to Asheville. 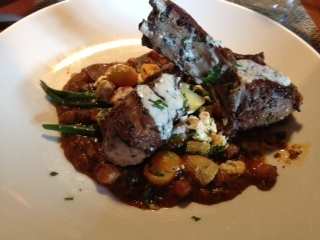 Our meals of duck and lamb were divine. If you go, be sure to have as your waiter, Mithran. He’ll treat you with aplomb and grace. Saturday’s dinner, our last with the Wilsons before heading to Denver was an equally delicious meal of Marrakech rubbed pork. Exquisite. I need to say no more. 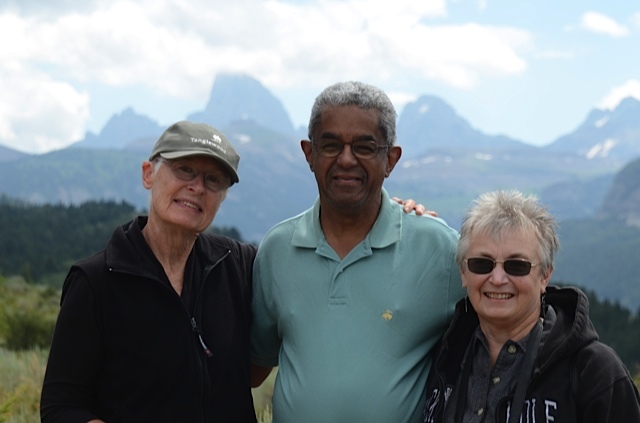 One of the joys in visiting Gordon and Linda were our wide-ranging conversations on politics, religion, world events, travels, plans for the future, our children and our professional experiences, to name a few. Most gratifying were our memories of growing up in New Orleans, particularly the talk about watching the Saturday night horror show of Morgus the Magnificent. Even though fright made it impossible to sleep, we were addicted to the show. The attraction was Morgus himself, an eccentric scientist dressed in a white lab coat with disheveled wooly hair; the dark circles around his eyes and crooked teeth made him both comical and fear-provoking. His commentary during the frequent program breaks was a major factor of the show’s appeal. Now that we are both retired, we have plans for the things we would like to do. Gordon calls it his Happiness File, rather than a Bucket List. I’ve already begun itemizing things for my Happiness File. Writing this blog about our travels is the beginning of that Happiness File. I’ve been advised repeatedly to stay active and continue learning during retirement. No problems there; I’ve always had a curious mind. On Tuesday morning Peter gave me my first lesson in sticking lumber. He and I traveled down the mountain in his large pick-up to an adjoining town to gather planks of lumber cut from trees on his forestland. In the sweltering heat, he and I loaded the planks on the cab of his truck and traveled about an hour and half across miles of highway and winding roads that snaked along two rushing creeks to a mill in Greenville, Tennessee where the planks will be dried and milled. We unloaded the truck and began sticking the planks. Being a neophyte lumberjack, I quickly learned that sticking involved piling the lumber in stacks by laying six to eight boards over several sticks spread about two feet apart. The layered sticks allow the boards to dry over two to three months. 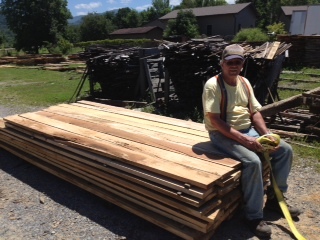 The enterprising Peter will use this lumber to build an additional room to his mountain home. I marvel at his prodigious talents as builder and naturalist. It was a pleasure to have worked work with my hands. Unlike my tasks in university administration, I could take immediate satisfaction in my work. Once our task was completed, it was time for lunch. We stumbled upon a country general store, filled the tank with gas and had the most delicious barbecue pork sandwich imaginable. Later in the afternoon, Peter and Miriam’s youngest daughter, her husband and three children from Morocco arrived for the summer. I had met the mother and father several years ago in South Bend, Melanie for the first time. Melanie and I enjoyed speaking French with the two older children, a boy and girl, age 7 and 4 respectively. The youngest, a girl, is only four months old. We regret we had only that evening and part of the next morning in their company. I suppose we’ll have to go to Ifrane, where they live, to extend our visit with them. That evening over a delicious meal of chicken and dumplings, our animated conversations covered wide-ranging topics, including news about life in Morocco. Melanie and I were last there in the spring of 1996, to visit friends from Humboldt State University, a professor and his family on a yearlong Fulbright. We loved the culture there, and often speak of returning. Now we have a good reason to do so. July 15. Our travels across the USA have taken us on a short jaunt to the Smokey Mountains of eastern Tennessee for Melanie’s great-nephew’s wedding. Zack is a graduate student in mathematics at the University of Tennessee and now married to a lovely veterinarian, also a graduate of the university. Family and friends of the bride and groom gathered together for a weekend of celebration at Montvale, a camp residence just south of Knoxville. Unwilling —really, too accustomed to creature comforts— to rough it in the communal living setting of a cabin, we opted to spend the weekend in a nearby motel. Friday afternoon was spent at the camp with the usual wedding preparations. We whiled away the afternoon meeting new friends, playing games, and drinking Zack’s homemade brews. I particularly liked the oak brew. Dinner was a communal feast of individually aluminum foiled wrapped vegetables steamed over a large campfire with grilled hamburgers. The titillating homemade brews enhanced the taste of the meal making for a memorable evening. Early Saturday evening, at the top of a grassy knoll under a cupola, Zack and Greta exchanged simple wedding vows of love and respect. As the wedding celebrant noticed, it was a union of both ends of the Appalachian Trail, Greta from Tennessee and Zack from Maine. After the customary wedding pictures, the radiant couple served the felicitous guests a sumptuous meal. The wedding cake was a potpourri of eleven cakes baked by friends. Later in the evening, Melanie and I, and Melanie’s brother and his wife, danced a waltz to the fiddle of Melanie’s great-niece, Regan, from Maine. We were surprised no one else joined us. Sunday morning, we recommenced our journey to North Carolina’s Pisgah National Forest to visit former Liberal Arts and Sciences dean, Miriam Shillingsburg and her husband, Peter. Their home sits on the side of the mountain at an elevation of 3500 feet. Built several years ago in the round, they live off-grid. On Monday morning, Peter and I went out in his newly purchased Kubota to check on his hydro-electricgenerator and water collectors. 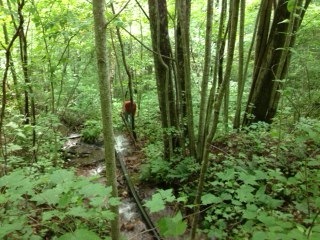 Climbing up and down the mountainside through thickets of brush, dense foliage and muddy ruts was quite a thrill. The Kubota met the challenges beautifully. This is our second visit to Miriam and Peter’s mountain hideaway. Peter took great pride in showing me the amenities added since our last visit. Reminiscent of Robinson Crusoe wilderness survival, there are the plantings of fruit trees and berry bushes; but what is most interesting are the ingenuously planned stockpiling of rocks as a home for rat snakes and the purposefully built bat houses. These “pet” habitats attract snakes and bats to control rodents and mosquitoes. No doubt, these two English professors are living the liberating effect of their liberal arts education. Adding to their home’s interest is the wooden floor laid out by Peter from trees on their property. The beautiful pie-shaped pattern is made of hickory, chestnut oak, red oak, sugar maple, hard maple, ash and cherry. MADISON. Today is my eighth day of retirement. I suppose that I’m slowly settling into the “retired” life. I’ve been too busy since my last day of work to fully appreciate what retirement means. That will happen sometime in the future. But for now as the days roll along, I can frankly admit that I’m content. Each day has been different. No meetings, no deadlines, no worries or responsibility for others. Surprisingly, letting go has not been difficult. The reason? The work of Academic Affairs is under good stewardship. 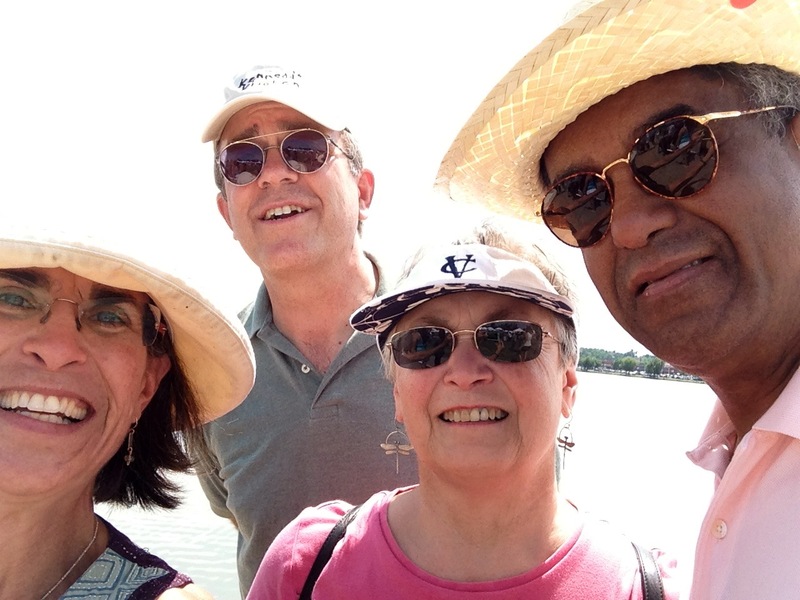 On Friday, we began the first journey of our cross-country wayfaring adventures with a visit to Madison, WI to see an ole Kellogg Fellow buddy, Tim, and his wife, Pat. 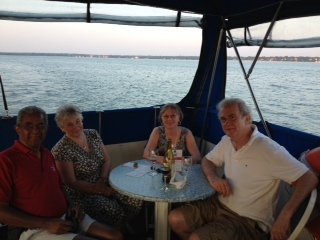 The weekend visit began with a Betty Lou cruise and dinner on Lake Monona. The weather could not have been more perfect. The boat glided over calm, clear waters in gentle dusk breezes. The panorama of grand summer homes and modest cottages, nestled among lush green foliage, splashed against the sky’s blue canvas, offering many artistic delights. An early Saturday morning walk and a casual stroll at the bustling farmer’s market in front of Madison’s imposing state capital, capped off a perfect beginning to the weekend. Saturday morning found us at the Olbrich botanical gardens where amblings among the floral pathways were equally invigorating as soothing. The day was capped off with a delightfully refreshing rendition of Shakespeare’s The Gentlemen of Verona by the American Players Theatre. As is the custom, just prior to the performance, we picnicked with our friends, feasting on Chinese chicken salad, quinoa and three-bean salad. Accompanying us were Pat’s and Tim’s granddaughter, their son and his girlfriend, and their longtime friend, Julie, whose husband, Louis, passed away a week earlier. Pat, Tim, Julie and Louis had been coming to these performances for thirty-four years. In Louis’ memory, we made a champagne toast. Like South Bend, Madison has a distinctive college-town feel, minus its industrial flavor. Our friends live near downtown, within walking distance of the university, in a neighborhood peopled with two-story 1920’s Dutch Colonial and other styles reminiscent of the period. The streets in this section of town are lined with large ash and elm trees. Lovely gardens add warmth and charm to each home that seemingly invites the passer-by to come in for a visit. Each home’s unique architectural style added further to its appeal. And speaking of architecture, Frank Lloyd Wright, as one might expect, is no stranger here. This morning we attended services at the First Unitarian Society of Madison whose original structure was designed by the famed architect and is now an historical landmark. The new church, recently completed just four years ago, adjoins the old church, but appears to be a separate facility. What is remarkable is that the new church mimics a Frank Lloyd Wright design and is environmentally friendly, achieving gold LEAD certification. For anyone visiting Madison, this is a must-see. I was particularly moved by the minister’s reflection of the day, “Things I Learned While Walking Down Sesame Street.” Although the message incorporated many themes promulgated by the children’s program, the one that struck me most was the lesson of acceptance, a poignant message for children in 1969 when the first show was transmitted. At that time, the national psyche was scarred by war and by the struggles for racial, gender, and economic equality. Oddly today, forty-four years later, these struggles persist. The afternoon was relatively quiet; naps, a walk in Tim’s backyard, a veritable botanical garden with a goldfish pond and waterfall, reading the newspaper, and comparing single malt scotches. I would not say that we are connoisseurs, but we both share a fondness for that liquid gold. With our wives as judges, we did a blind taste test of four scotches, two Islay single malts, Laphroaig and Kilchoman, and two blended ones, Johnny Walker Red and Johnny Walker Double Black, the latter newly distilled in 2013. Happily, Tim and I got all four correct. The two Islays were peats, but we were both surprised how the JW Black rivaled the Laphroiaig for its peaty taste. Save the red label, we agreed all were of superior quality and worthy of consumption. So far, I’m having a wonderful introduction into retirement. For my readers, I do want to call attention to the column in today’s New York Times by the famed neurologist, Oliver Sacks, on “The Joy of Old Age. (No Kidding. ).” The article offers me informative lessons to accept retirement as an opportunity to explore and enjoy all that life has to offer. I believe, I’m off to a good start. Yesterday was the first day of the next phase of my life. Retirement, after a year’s delay, has finally begun. The day started pleasantly. Because the morning air was cool, I did not sit on my deck with a the newspaper and a cup of coffee as anticipated. Rather I spent over two hours downtown at Chicory Cafe with my MacAir reading and delivering e-mail messages. I was more relaxed than I would have imagined. Typically, I’m there briefly to pick up a good New Orleans coffee with chicory on my way to work. Occasionally, I would meet faculty colleagues there for coffee and breakfast, ostensibly to discuss university affairs or to gauge campus climate. The rest of the day passed quickly with visits to the Social Security office, to the Verizon store, and to the supermarket. Quite a contrast to my usual day of meetings — planning, finding solutions, etc. Later in the day, Melanie and I played a game of cribbage; I barely squeezed a win. But she did beat me in a game of Kings’ Corner. After dinner, a faculty friend came over with a bottle of single malt. We sat on the deck oblivious to the cool breezes. Today was similar to yesterday, only this time instead of coffee downtown, I went to the gym to workout, and then to visit a friend in the hospital. Later today, I’ll do some reading, and maybe a late afternoon nap, pleasures not possible during my university administrative days. So, I’m slowly easing into the retired life. Friends tell me that I will be busier than ever. Perhaps so, but for the moment I am content to be idle, to allow myself time to relax. I’m happily spending more time with Melanie, a great perk of retirement. Fairly soon, we’ll begin our cross-counrry road trip, visiting family and friends along the way. It may seem as if I’m making an easy transition from work to retirement. My emotions last week were a jumble of elation and sadness. 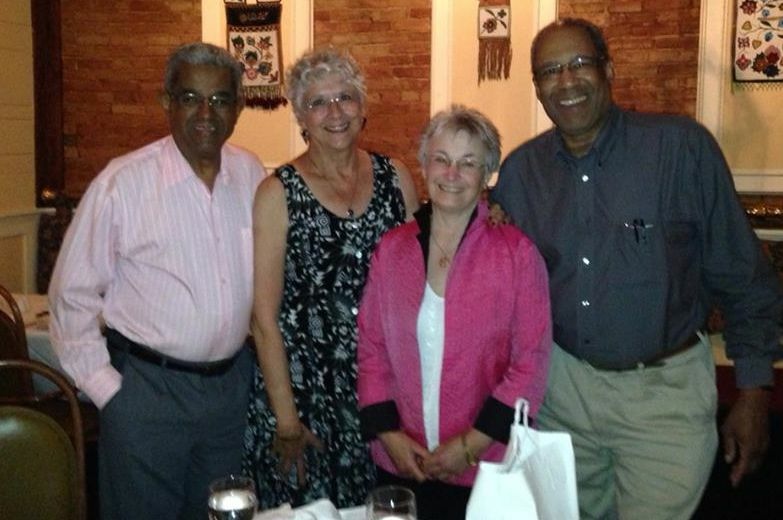 I was happy to retire, but I knew deep in my heart that I would miss terribly my faculty and staff colleagues. It was not easy to leave the office on Friday. Fourteen years at IU South Bend as executive vice chancellor for academic affairs cannot be wiped away so readily. The separation finally hit me when I turned over my master key to my replacement, Johnny. I, who could open practically any door at IUSB, suddenly had no access. And then there were the streams of visitors stopping by to express what my tenure has meant to them and to bid me farewell. 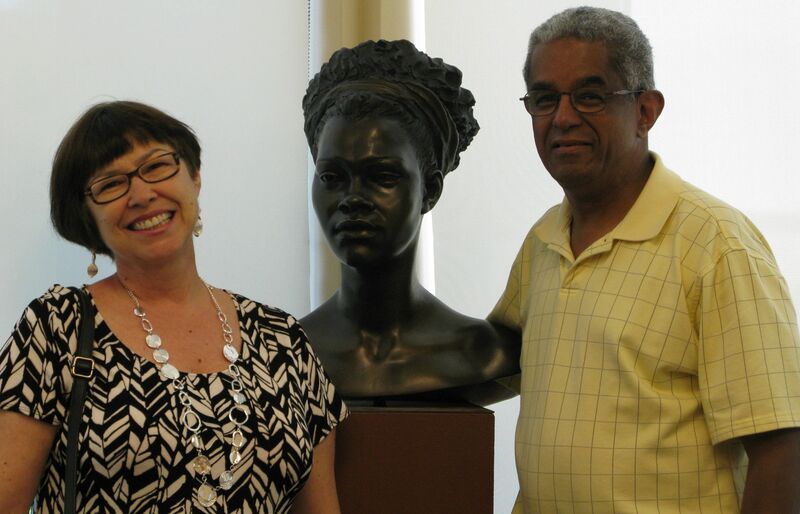 In the early afternoon, a group of faculty, administrators, community friends, and Melanie surprised me with the presentation of Dora Natella‘s beautiful sculpture that for several years graced my office. I’m deeply humbled by this gift and thank all those who made it possible. Already overwhelmed, and dreading my final good-byes to my staff, several faculty and administrators came later in the afternoon with bottles of champagne to celebrate my retirement. Finally at five o’clock there were more hugs from well-wishers as I walked to my car. Later that evening our good friends the Wycliffs celebrated my retirement by treating Melanie and me to dinner at the Carriage House, am elegant restaurant in South Bend. Over the weekend, I was in a state of mourning. That’s the best way I can describe my feelings, knowing that on Monday, July 1st, I would not be going to work. I spent two days grieving. For fourteen years, IUSB has been a very special part of my life. For that reason, I will allow myself to grieve, knowing that as time passes and as I enter into new adventures, my grief will fade away and be replaced by new joys.